Where does the Bar Model approach originate? There is some confusion about where the Bar Model approach originated from. Many are saying from Singapore but there is evidence that Russia and America were using the technique before Singapore. One thing that is for certain, is that Singapore made the Bar Model approach more of a “house hold” name in their own country and now it’s being exported all across the world by consultants such as Dr Yeap Ban Har and Dr Fong Ho Kheong. Around 1985, Dr Kho Tek Hong, a former Maths teacher and curriculum specialist, lead a team to change the way Singapore taught Maths. What he, and his team, did turned out to make a huge difference in the way Singapore evolved to be one of the major economies of the world. Looking at the research available at the time, they created what is now known as “Singapore Maths” and which is being exported to many countries all over the world. Dr Kho is sometimes referred to the creator of Singapore Maths and the bar model approach which has played a significant part of the success the country is now known for. In 1995, the TIMSS benchmark concluded that Singapore were the leading nation in the world for Maths – just 10 years after the new curriculum came into effect. It was an incredible achievement for Dr Kho and his team and it led to international curiosity. What was Singapore doing that was so different? 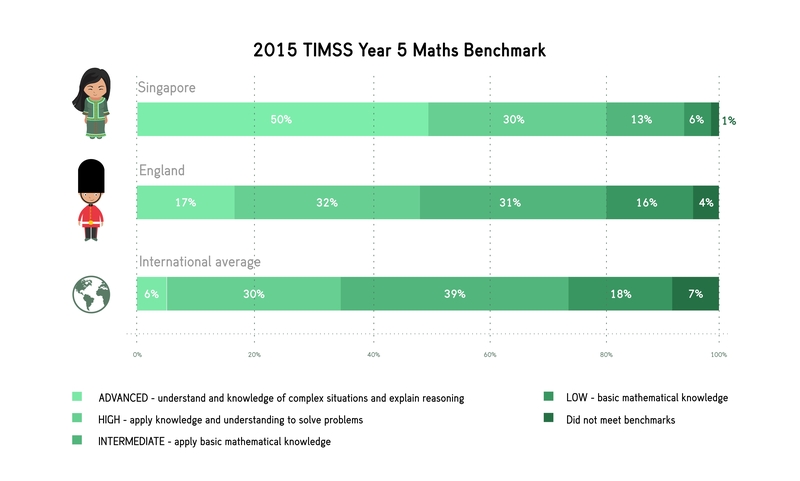 The most recent TIMSS (2015) benchmark suggests that Singapore is still the leading nation in the world for Maths at both Year 5 and Year 9 (the only two benchmarks). England, as can be seen from the above infographic, are in 10th place, far behind Singapore. Singapore professors like Dr Lianghuo Fan (University of Southampton) suggest that the incredible success of Singapore is largely due to the Bar Model approach. 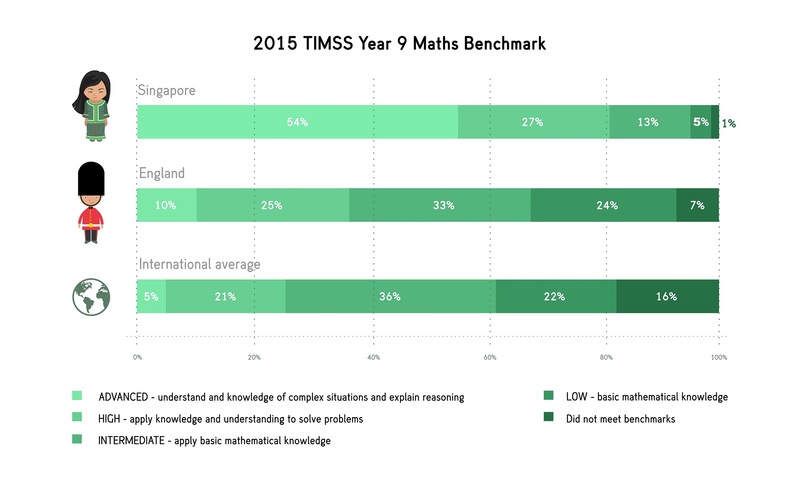 The TIMSS (2015) Maths benchmark suggests that by the end of Year 5, around 50% of children in Singapore are advanced learners. What does that mean? It means they are very strong mathematicians whom can typically solve complex questions in all mathematical topics. These advanced learners will also be very strong problem-solvers! In most cases, an advanced learner would be able to solve complex 3-4 step word problems, some of which we have never seen in England. By the time our students in England end Year 9, they are on average, just under 3 years behind students of the same age in Singapore. This is astonishing and hence the coalition, at the time, made way for the new National Curriculum (2015) based heavily on the Mastery approach to teaching which includes the Bar Model method. We are the Bar Model training specialists. We deliver in-house training and seminars on the bar model approach.